The Rexel Prostyle+ 7 is a smart looking cross-cut shredder that shreds up to 7 sheets of 80gsm paper at a time. It’s suitable for your home or small office shredding and shreds material into 4x45mm pieces. 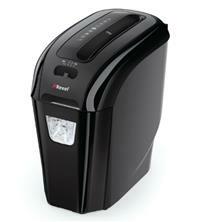 This gives it a P-4 security rating which means it can be used for highly confidential shredding. Bin-size is a good 12 litres so it will allow you to shred up to 80 sheets before it needs emptying. Plus, the see-through window at the front of the shredder allows you to see when it is nearly full. The Rexel Prostyle+ 7 shreds a variety of media including paper and credit cards. It will also get through staples and paper clips too which means you can spend less time prepping your documents and more time shredding. Noise level is less than 73 dBA and with its stylish black finish and features, the Prostyle+ 7 is a good choice for reliable shredding in the home or small office.